Blood Oranges are back in season! When I was in the market a few weeks ago I was surprised to find blood oranges in the citrus section. Last year I was only able to get blood oranges for 3 weeks. That’s it. They were in the store, I bought a bag of them 3 weeks in a row, and then I never saw them again. I’m pretty sure it wasn’t until March that I even got them. This year they were here in February and I’ve seen them at not one but two of my markets every week! Of course I’ve gone crazy for them and have been buying a 2 pound bag every week. Why are blood oranges so special? It’s all about the flavor and color. To start with they are a gorgeous, deep pink color inside so anything you make with them has a lovely color. Secondly, the flavor is outrageous. They have a deeper flavor, it’s sweeter, and it tastes faintly of raspberries mixed with oranges. Delicious! 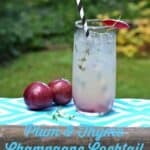 Last year I made cosmopolitan’s with the fresh squeezed juice but it was a pain because I had no juicer. This year, my friend Adrienne bought me a lovely handmade juicer which made juicing these a breeze! Instead of making the cosmopolitans, which are a little sweet but awesome, I opted for margaritas because I knew my husband would enjoy them. 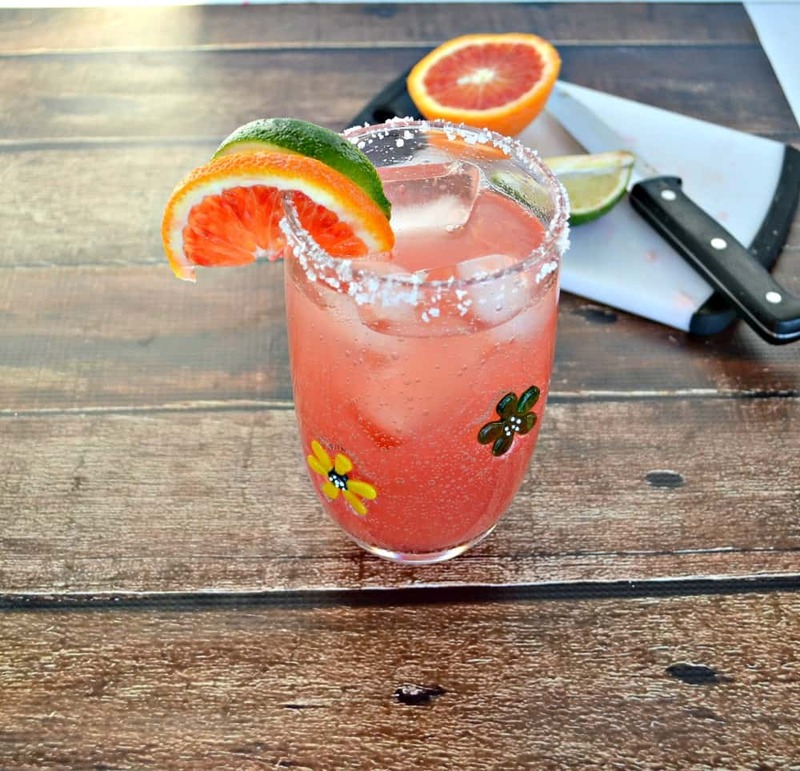 The blood orange margaritas are made just like a regular margarita with tequila, triple sec, and lime juice. 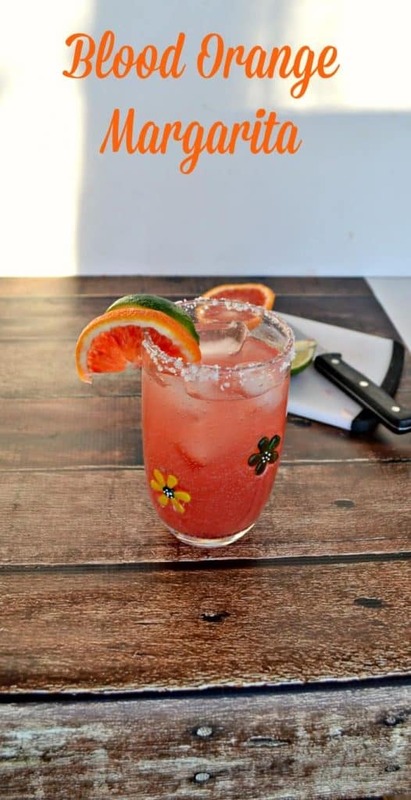 The addition of the blood orange juice adds sweetness and color to the margarita. 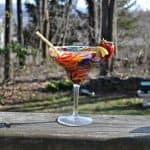 The margarita is both sweet and tart and tastes great with a little salt on the rim. We had a few of these last Friday night and I’m pretty sure we’ll be enjoying them again this weekend! 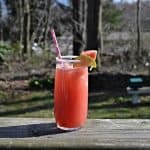 A twist on the traditional margarita with fresh squeezed blood orange juice added to the mix. Pour the ingredients into a shaker over top of ice. Shake for 30 seconds. Run a slice of blood orange around the rim of a glass and dip the glass rim into salt. Fill the glass with ice. 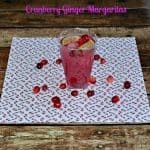 Pour the blood orange margarita over top of the ice in the glass. Garnish with slices of lime and blood orange.